After trying a couple ideas of apple pie recipes (one of which I will post to share in a few days, it is worthy of remaking again) I landed on this pie to try and win my daughter's school's Apple Pie contest. It did not win, but I am sharing it all the same because I think it is a worthy pie. It would make a great dessert for Thanksgiving or even Christmas. I would suggest serving it warm with a dollop of vanilla ice cream. Now, this pie is a bit time consuming (what pie isn't?). But you can do some things ahead of time to make things convenient.The crumble can sit out a day at room temp or in the fridge for a week. The pie crust can be kept in the fridge for 2 days or frozen up to three months. If you premake these elements, all you need to do is defrost (or warm at room temp for 10 minutes) your dough, roll and bake your bottom crust the day of and prepare your apples and finish. (Oh, and eat it!) Enjoy! First make your crumble. Toast the pecans in a small frying pan over medium heat until they are a dark brown color. Let them cool. Add the sugars and spices into the food processor and puree. Add the pecans and flour, and add the salt. Puree again and add the butter and vanilla and puree until crumbly. Pour them into a bowl and with your fingers, press the crumble so there are different sized crumbles and set aside. Next, make your crust. Freeze your butter until solid, about a half hour or so. In a food processor, pulse the flour, salt, baking powder, and sugar. Then add the frozen butter and pulse until the butter resembles the size of large peas. Add the cold cream cheese and pulse until the butter resembles small peas. Add the vinegar and apple juice and pulse. The mixture will be crumbly. Press it with your fingers, does it feel like with pressure it will come together? If not, add another Tbsp. of juice and pulse a little more. Add juice a Tbsp. at a time and pulse until the mixture comes together with your fingers pressing it, dump the mixture on a large saran wrap covered surface. Using the side of the wrap, push the wrap over the edges of the pile and begin pushing and pressing the dough together using the saran wrap under your hands. Eventually, have the saran wrap cover the dough, and using your hands, push it flat and then shape the dough into a flat, round shape. Work fast, you don't want the butter to melt. Once the dough is a nice shaped flat disc wrapped in saran wrap, place it in the fridge to rest for at least 30 minutes. When ready, take the dough out and let sit for ten minutes on more plastic wrap lightly dusted with flour on a work surface until the dough can be rolled out. Cover the dough with more floured plastic wrap and roll into a circle large enough to fill your baking pan. Flip the dough onto your dish, peel the bottom wrap off and gently push the dough into your pan. Crimp the edges. Cover and chill again for an hour. Place a foil-covered baking sheet on the bottom rack of the oven. Preheat oven to 425˚ for 20 minutes before baking-so I usually get it going while I prep the apples. While the pie shell is chilling, prep your apples. In a very large bowl, toss the sliced apples with the lemon juice, cinnamon, nutmeg, bourbon, and sugars. Let the apples macerate for one hour or more. Next, bake off the pie crust. Remove crust from the fridge and unwrap. Line it with a cut-to-fit parchment paper circle and use old beans gently in the pie as weights. Place the crust right on the baking sheet and bake for about 20 minutes. Remove from the oven and gently take the paper and beans out. Poke the bottom and sides with the tines of a fork and bake until pale golden, about 3 more minutes. If you see some bubbles forming, poke it gently with a fork. When ready, take the crust and put it on a baking rack to cool. After 3-4 minutes, brush the bottom and sides with the egg white. Let cool down completely. Using a fine metal sieve, pour the apples into a fine metal sieve and drain all the liquid. You should have close to a cup. Transfer the apples back into the bowl and toss with cornstarch. Take the liquid and pour it into a small saucepan. Over medium heat, add the 2 Tbsp. butter to the liquid and simmer for 15 minutes or so. The liquid will reduce down to about 1/3 cup and into a syrup. Pour the syrup back into the apples and toss. Meanwhile, melt the caramel in a small saucepan until it resembles a sauce. Drizzle a third of it on the bottom of your cooled pie crust. Pour half of the apples over it. Add another third of the melted caramel over the apples and pour the rest of the apples over it. Drizzle the rest of the caramel over the apples, then tent the pie with tin foil, crimping over the crust. Make 3-4 vent holes into the tinfoil tent. Place the pie on the baking sheet and bake for one hour. Lower the oven to 400.˚ Take the pie out, and intent the pie and make a foil ring or a crust shield around the crust. Press the crumble into the top of the pie, covering the apples. Bake for 15-20 more minutes until the top is a nice, golden color and the apples are bubbly. Let the pie cool on a rack for an hour. While it is cooling, make the caramel sauce. Melt the caramel squares in a small bowl with the milk and apple juice, microwaving it for 1 1/2 minutes, stirring every 30 seconds until smooth. Let sit to thicken up for 10 minutes. 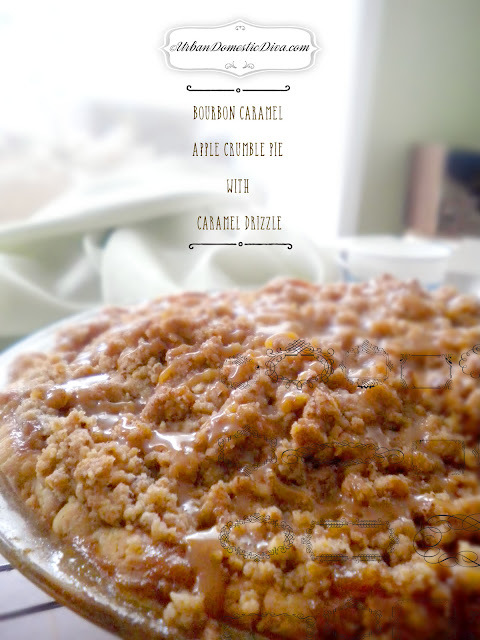 Using a squeeze bottle or a pastry bag with a small pen tip, drizzle the caramel all over the pie topping. Serve warm.